ohhh, thank you, they are so inspiring…. These are so sweet together. I never know how people make these collages from their Flickr favorites. these make me smile!! i LOVE this time of year. love all the candy cane ones! you may have inspired me to find a little holiday cheer, this would be the first time in uhm…30 years? Lights are so much fun to photograph! and I love those candy cane shots, very cute. on December 4, 2008 at 1:52 pm | Reply YUMMERS! 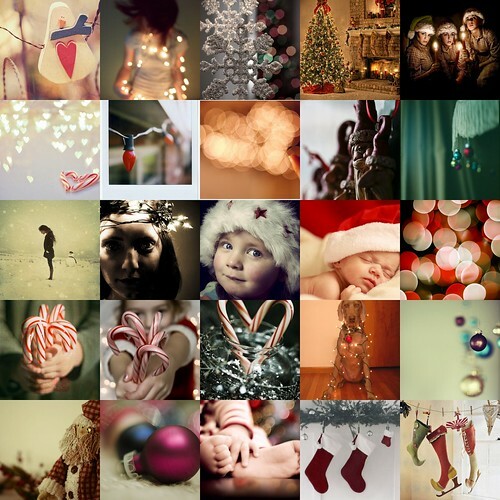 Your photo mosaic is fun and gives me holiday goosebumps. If you haven’t used Fimo before… I used to make a lot of jewelry and things for the family dollhouse… it is toxic. Put tinfoil on your cookie sheet so you can keep it free of toxins. Your ornaments are adorable. You’ve inspired me to give it a try again. Your mosaics are always so wonderful…this one is no exception! I love discovering other photographers too. Thanks for the inspiration. What a great & merry collection of photos!